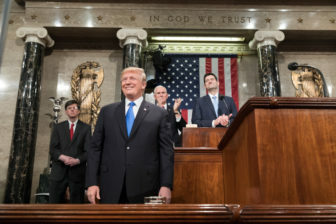 President Trump delivering the State of the Union address last year. Washington – Connecticut lawmakers are participating in the ritual of sending a political message through the choice of guests they invite to President Donald Trump’s State of the Union speech next week. Sen. Chris Murphy on Friday said he has invited Regina Moller, executive director of Noank Community Support Services, to next Tuesday night’s speech. The non-profit, located in Groton, has a contract with the Department of Health and Human Services to provide shelter and services to unaccompanied minors separated from their families at the U.S.-Mexico border. At the height of the immigration crisis last year, the NCSS sheltered two Guatemalan children, who were eventually reunited with family members. The NCSS also relies on grant money from the U.S. Department of Housing and Urban Development to provide housing for homeless, young adults. Because of the partial government shutdown last month, Murphy said, the Noank Community Support Services stopped receiving federal funding and had to use its own money to continue to run the shelter. Sen. Richard Blumenthal, meanwhile, has invited Gerry Wright, a vocal advocate on behalf of Vietnam veterans who were exposed to toxic substances during their military service. Blumenthal, a high-ranking Democrat on the Senate Veterans’ Affairs Committee, has sponsored a bill seeking parity for U.S. troops who suffered from exposure to Agent Orange. For instance, sailors who patrolled territorial waters off Vietnam, but didn’t come ashore or operate in “brown water” nearer to sprayed foliage or runoff from dioxin-laced herbicides. Legislation, sponsored by Rep. Joe Courtney, D-2nd District, that would give these “Blue Water” sailors the same disability and health benefits as others who suffered from Agent Orange exposure, passed the House in the last Congress but stalled in the Senate. Blumenthal said Wright, who served in the U.S. Army during the Vietnam War, was exposed to Agent Orange, leaving him with permanent medical problems. Wright approached Blumenthal’s office last year to advocate for new legislation after riding more than 10,000 miles on his motorcycle to raise awareness about Agent Orange exposure. Other Democrats in Congress have invited immigrants who worked for Trump properties while undocumented and federal workers affected by the partial government shutdown. Some female lawmakers will be wearing white to honor the women’s suffrage movement. The president’s annual State of the Union address is a major event on Capitol Hill. It was postponed this year because House Speaker Nancy Pelosi, who invites the president to give the address to a joint session of Congress, preferred that President Donald Trump not give the speech during the partial government shutdown, which lasted 35 days. Trump has not announced who he has invited to sit with First Lady Melania Trump, but presidential guests also tend to be chosen to send a political message.